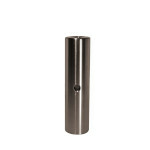 Base Lab Tools Stainless Steel Post 1.5" x 4"
Stainless Steel Post 1.5" x 4"
PTBL304 Stainless Steel Post 1.5" x 4"
1.5" diameter, 4" length stainless steel post. One end of each post is tapped with #8-32 threads, and the other with 1/4-20 threads. Each post is supplied with an #8-32 set screw.